Alasanda Vada / Black Eyed Pea Fritters are a very common treat on the streets of many Andhra towns. Just like how Masala Vadas adorn the streets of many tea shops I was taken in by the way these vadas are so easily available. At home it was only on special festival days that Amma used to make these vadas with Black Eyed Peas but imagine this being a common dish. When I think about this snack, I get reminded of my first visit to my in-laws place. During one of the afternoons, Athamma prepared this on hubby dear’s request. He said the way his mom makes, it turns out simply too delicious. And given with my love for fried stuffs, I wasn’t about to say no. It was only a while since we had our lunch and I saw that Athamma was immediately out with preparing the evenings snacks. I remember those days she making these with skin on and she has to remove them and all. With the afternoon sun rays seeping in through the open terrace, that one finds in those traditionally built houses, struggling to settle well after a heavy lunch, I was still eagerly waiting for the vadas to be done. I had to agree that Athamma was a pro when it comes to making these deep fried snacks. The regular ones tastes great but at times it does end up dunking lot of oil. This time when Amma made she wanted to make it more healthier by added carrots and it ended up being very delicious not to mention healthy too. Chinnu liked these so much that he wanted me to prepare it again and again. I was very happy that he liked it, makes life easy if at least one of them eat something and like it enough to ask for more. Wash and soak the black eyed peas overnight. Then grind the peas with very little water to a coarse paste. Take it in a bowl and add the besan, grated carrot, finely chopped chilis, grated ginger, finely chopped coriander leaves and curry leaves. Adjust the salt. Mix everything together. The consistency should of the regular vadas. Meanwhile heat a pan with oil. Then pat down as small circular discs and gently drop them into hot oil. simmer down the flame and cook on both sides. Remember to regulate the oil as if you cook it in low flame the vadas will dunk more oil. My moms recipe is similar to yours but she doesn't add besan.. and off course no carrots but the addition does make the vada healthier! yum..
Mu MIL makes killer alasanda vadas but without carrots and she adds lots of mint and some garlic to make them extra spicy. Yours look delicious. I hadn't heard of this. 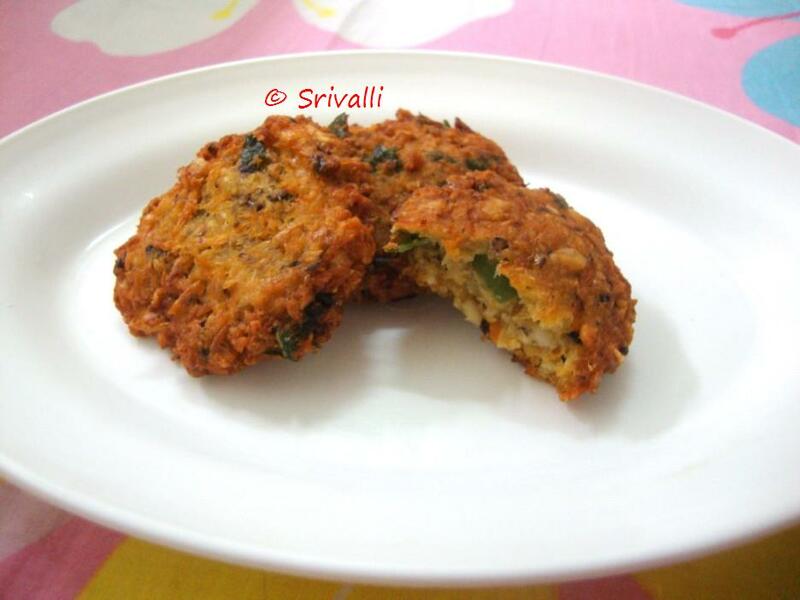 A nice variation to regular masala vada. yummy yum yum yum!…I wish I could have these now…they are awesome! Crispy vadas ,adding carrot is a good idea to make kids eat some veggie's..
My mom adds Cabbage to make these delectable vadas! am going to try this next week for get together..sounds yumm.. 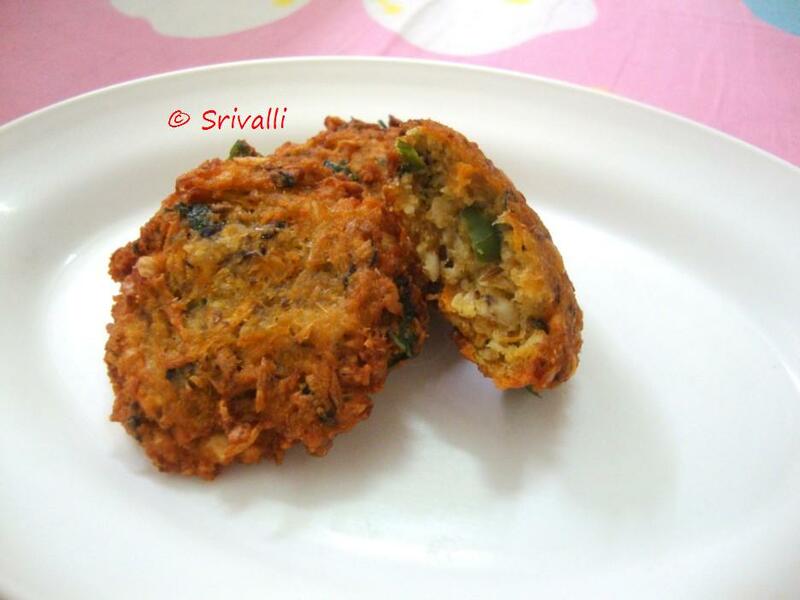 I make this too…but I like the addition of carrots in your vada. Must try that out next time. Crispy vadas looks sooo yummy..
have not seen this vada before……..i think not common in kerala….but looks yummy…….will try surely.. I make alachandalu palak vada carrot sounds interesting Valli will try next time.Looks crisp and yumm. showed these to mom yesterday and she was pretty impressed and wanted to make it. Hope this comment gets published. With carrots that more that I can ask for.Crispy and healthy! Yummy! I am making make them soon. I never thought of adding carrots to this particular vada. Nice touch. this is new to me. Have never eaten this, looks very tempting, will surely try this out sometime!! Plain Black eyed peas vada is quite regular..nice that so many love this snack..
wow, love it, looks beautiful.